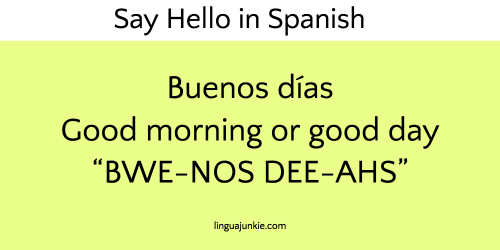 June 29, 2018 by The Junkie 0 comments on "10+ Ways to Say Hello in Spanish (Listen to the Audio)"
You’re here because you want to say hello in Spanish, right?. Read this. 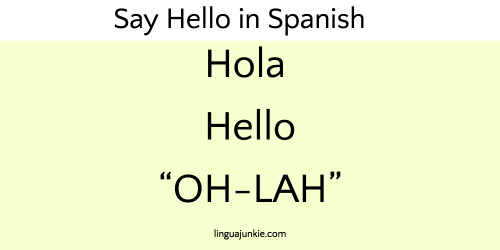 It’ll take you 2 minutes to learn all kinds of Spanish Greetings. If you don’t, I don’t care – this is ONLY for people that truly want to speak Spanish. 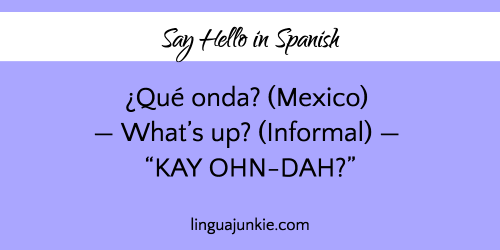 This is simply the easiest way to say hello in Spanish! 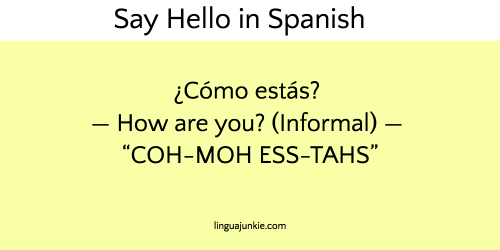 Note: You should also HEAR how to say Hello in Spanish. Press play below. 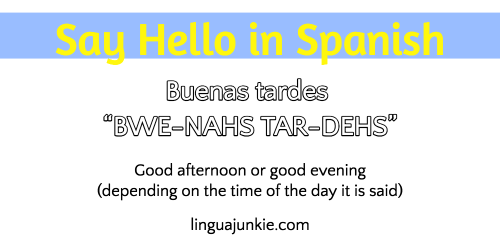 Try this Free 2-minute Lesson from SpanishPod101.com (click here to visit) to hear the common Spanish greetings. This can also mean “Good evening”, but is most commonly used when someone is heading to bed and they want to indicate that they will sleep soon. I am going to bed. Goodnight! 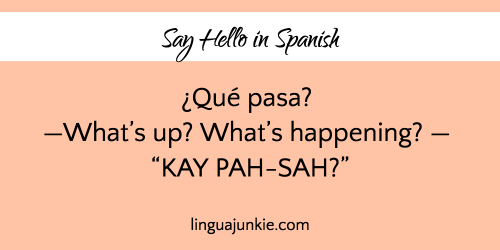 The next few phrases will teach you various ways to ask “How are you?” or “What’s up?” in Spanish! 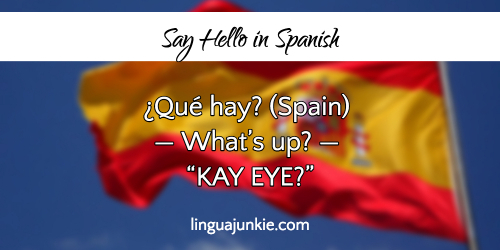 While these are not literal ways to say hello in Spanish, you can use them as greetings. Usted is used in formal situations, when you do not know someone or are talking to someone who is your superior, such as a university professor. This is the simplest, informal way of saying “How are you?”. You would use this to speak to a peer or a member of your family. This is a much more informal way to say hello, very similar to “What’s up?” in American English. I know this example sounds funny, but that’s because it’s actually a cute rhyme that children in Latin America use! It’s similar to how we say, “See you later alligator” in English. If you’re in Spain, you will commonly hear this phrase amongst friends. It means, “How’s it going?”, but you can include estás to your friend, to ask how they are. Now that we know how to say hello in Spanish, and know how someone is doing, here are a few phrases to describe what you like. Before getting romantic with someone and saying you love them, you might just want to tell them you enjoy their company. This one is simple: “Me gustas”. If you want to describe your taste in movies or chocolate or anything else, simply use the phrase “Me gusta” and add the word that you like. If someone asks you how you are using phrases like those in numbers 5-10, you can respond with describing how you are. You can say, “Estoy bien” meaning “I am good”, or “Estoy mal”, as in “I am feeling poorly”. 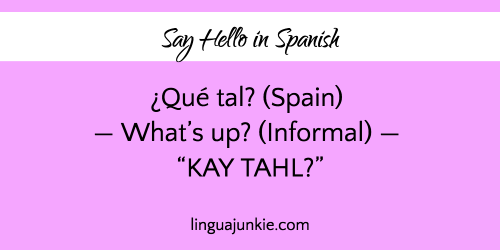 You learned how to say hello in Spanish, right? 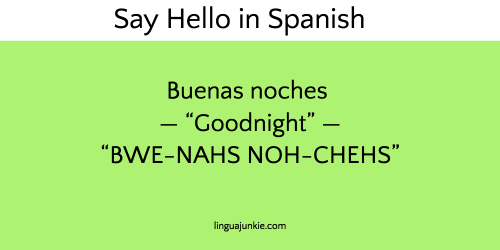 Now, let’s learn various ways to say “goodbye” in Spanish. The simplest way to say goodbye in Spanish is “adiós”. This can be used formally or informally depending on the context. This is another very common “goodbye” greeting that it most similar to “see you later” in English. Example: “Necesito dar de comer a mi perro. ¡Hasta luego!” — I need to go feed my dog. See you later! Of course this phrase was popularized by Arnold Schwarzenegger in “Terminator 2”, but it actually is a common way to say goodbye in Spanish. 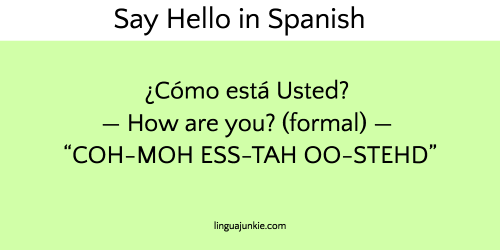 Now you know how to say HELLO in Spanish. And, you learned a whole bunch of other phrases in the process. Are there other phrases i should include here? What’s your favorite? Why are you learning Spanish? Leave a comment! You get 1,000+ audio/video lessons made by real teachers. They teach you conversations so you can start speaking — from Beginner to Advanced. Also, I like them because they release new lessons which are free for all users. So, go check out their Spanish learning program.